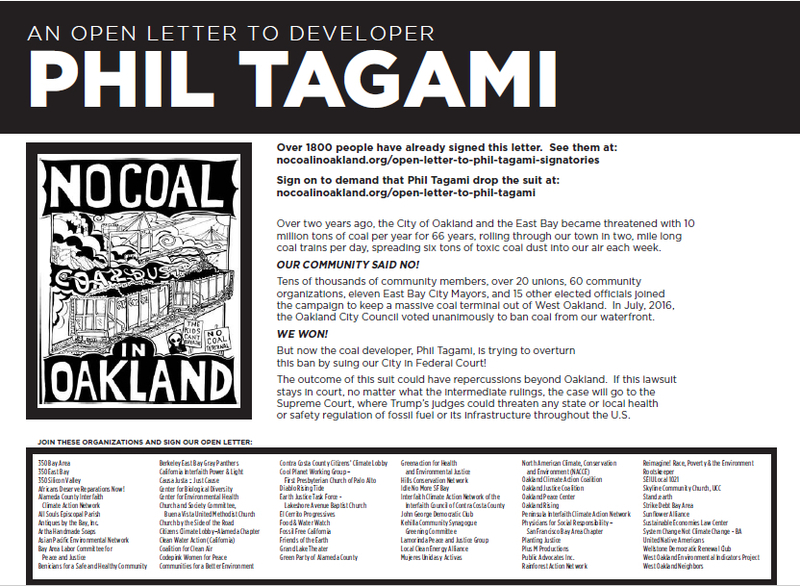 No Coal in Oakland’s Open Letter to Phil Tagami — calling on the would-be coal developer to “dismiss his lawsuit against the people of Oakland,” and “get to work on a plan that makes sense for one of the few remaining undeveloped parcels on our public waterfront” — was published late last week in the East Bay Express and the Oakland Post. We call on Phil Tagami to dismiss his lawsuit against the people of Oakland and give up his plan to build the largest coal export facility on the West Coast right here in Oakland. It is time for him to come up with a cleaner, safer, healthier, and more sustainable use for Oakland’s publicly-owned West Gateway. We support the City Council’s decision in July 2016 to ban coal storage and handling in Oakland. Rather than accept the will of the people, who collectively have contributed nearly $500 million in local, state, and federal funds to redevelop the former Oakland Army Base, Tagami hired one of the richest law firms in the world to sue Oakland, claiming our ban on coal violates his Constitutional rights. By pursuing litigation that could last for years, he is putting off the creation of jobs that he promised and Oakland residents desperately need now–and diverting city funds to legal defense that would be better spent to meet the needs of Oakland residents. By insisting on his right to ship coal when the world is turning away from coal, he is chasing his own quick profits from building a coal terminal while taxpayers will be left holding the bag when the coal export scheme collapses. We ask Phil Tagami to drop his lawsuit and get to work on a plan that makes sense for one of the few remaining undeveloped parcels on our public waterfront. NO COAL IN OAKLAND! Tagami’s lawsuit in Federal Court endangers communities far beyond Oakland’s city limits. If the lawsuit is not withdrawn — no matter how it is decided in a trial at the District Court level, and no matter how intermediate Appellate Courts rule on the case — it will be appealed all the way up to the U.S. Supreme Court. There, a conservative panel of Supreme Court justices could limit the authority of any state or local health or safety regulation of the fossil fuel or the infrastructure used to extract and burn it. NCIO is still collecting signatures from individuals and organizational signons, and will continue to update the list of organizational and individual signatories. We will not give up our fight until the threat of a toxic coal terminal on Oakland’s waterfront is fully and certainly defeated.